Hold on, if you really don't know the basic concepts of spring please look at it first. OK, we are fine now. No more prerequisites. Not like other tutorials this implementation is using custom JDBCTokenStore to store client id/secrets and user authentication details in MySQL DB. 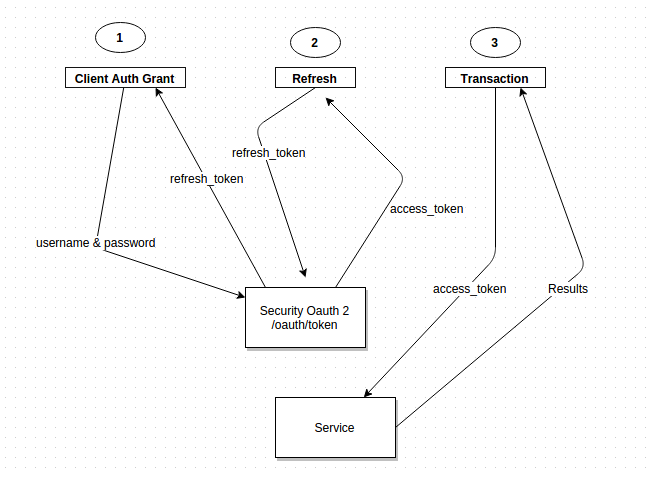 Here I'm going to implement 3-legged oauth flow and please check the below diagram in order to understand this. Create database as oauth and then use import.sql file to create tables and add some seed data. You can use Authorization header to send the access token for protected resources. Clone the repo and change it accordingly for your needs. Happy coding! what is difference between first and second access_tokens? Can you help me to create Spring Java config of OAuth2 server? hi, thanks for the great blog! i wanna know how to set the expires_in for longer than 5 seconds? I've modified the data but still everytime i restart the server, it got back to 5 seconds ? Hi Ronald I am also facing same issue. Please let me know if you could solve it. Im also facing the same issue..
facing same issue...also confused with first and second access token. Thanks for a great post!! Im also getting access denied... Did any figure out why it is happening. The implementation generates and stores tokens correctly but no access? I implemented in the exact way you have mentioned but unfortunately getting bad credential password not matching issue showing. Got this error with valid access token. after debugging spring api i found this due to authority collection getting null value . Thanks for the blog post. Its indeed very helpful. What if I am not using Spring Security Password Encoder? I have my own custom password encoding function in a REST API. How can I integrate that here?